Since moving to Richmond, VA six years ago, I've never successfully maintained a compost pile. The first time, I kept it in a big garbage pail that my landlord had okay'ed, but after several months when I was ready to use the compost he came and dumped it in the garbage. This happened to me twice! In my second apartment in Richmond, I had a composter out back, but then the chimneys of the apartment caught on fire and I had to move out so my landlords could repair the building. In the rush of having to find a new place to live in the middle of February, I didn't bother bringing my composter over, and I think my landlords threw it away. I thought I was done with trying to compost in an apartment, especially because now I live on the second floor. But I had a big pot on my balcony that I started throwing vegetable scraps into over the past winter. 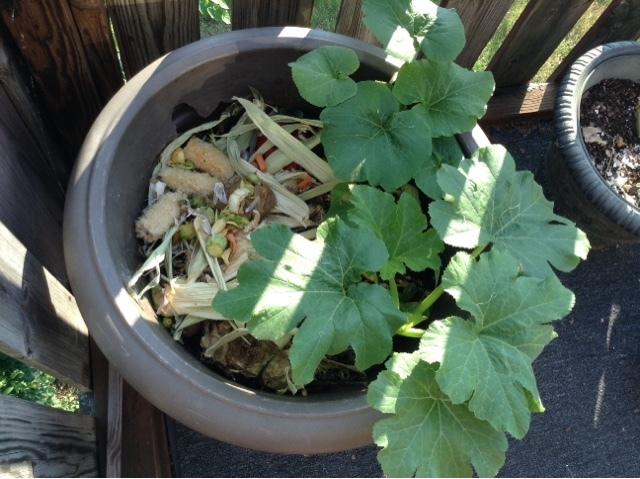 In the spring I bought a little shovel so I could turn my compost, and I decided to keep it up. Look what grew out of my compost last month! At first I thought it was zucchini or maybe cucumbers. Then as I was weeding through the compost and pulling up the dozens of plants that had sprouted, I saw the baby leaves of one sprout still stuck inside of a seed... a PUMPKIN SEED!!! So it turns out I am growing pumpkins. My next door neighbor gave me a pie pumpkin when she moved out, and it just sat there until it started rotting, so I threw it in the compost pot. I've never grown pumpkins before, and I think it will be really fun. I transplanted a couple of the pumpkin plants to another pot, and kept a couple in the compost. I learned that pumpkins like very rich, well-fed soil, which makes sense since they grew out of my compost. 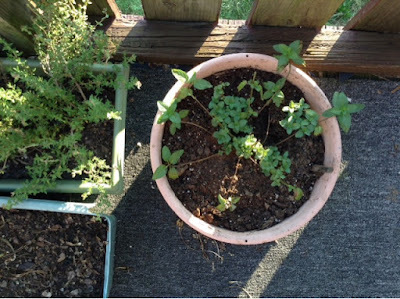 Here's my mint plant that started sprouting a bunch of babies after I harvested some of the sprigs for mint tea. I also bought a bunch of herb plant starters because I want to create a medicinal herb garden. Nothing too crazy, since I'm just an amateur gardener. I'm studying up on the medicinal benefits of herbs, like lemon balm, chamomile, mint, and thyme. I highly recommend the book "Medicinal Herbs: A Beginner's Guide" by Rosemary Gladstar. It focuses on 33 herbs (many of which are common kitchen herbs) and recipes for using them for healthful benefits. I welcome any other book suggestions on herbalism for the beginner if you want to leave a comment below! - Clean the mint by placing it in a bowl of water for about ten minutes and let the debris sift away. - Put a small pot of water on boil. - Turn off the heat and place mint leaves in water and let steep, covered, for at least 20 minutes - the longer the stronger the tea. (I like it strong!) I'm not sure if you HAVE to remove the leaves from the stems, but I do because I'm afraid the stems might make it bitter. I will have to test this theory and see if there's a difference. - Pour in some honey to sweeten and place the concoction in your fridge. - Drink cold glasses of tea whenever you feel sluggish in this summer heat. It's so refreshing and it really helps! I've always loved plants, but I know relatively little about them. Learning about their benefits makes me happy and I feel more connected with the plant. I think the reason I love plants is because they are quiet and it's easy to see how they work with outside nature (the seasons and weather conditions) and their own natures. Ever since my aunt helped me transform my parents' yard into a garden about eight years ago, I learned that plants can be like humans. Some plants (like mint) are thugs and will take over if you don't reign them in! I felt bad pulling out all the mint to make way for other plants, until I saw how their root systems send runners all across the soil, even under our porch steps. Then I wasn't afraid to pull them. Some plants thrive in poor conditions, showing that they have an inner strength - they're survivors. Some plants are fussy and need a lot of care. Some plants like a lot of sun shining on them, and some wither under all that light and prefer the shade. Some take a long time to bloom. Purslane, one of those plants that thrives with little care. I think if I was a plant, I'd be one of those plants that doesn't like too much sun, is a slow bloomer, and is somewhat delicate yet also stubborn, refusing to die. As I was looking up websites on herbalism and on growing pumpkins, I stumbled across the information that plants that have been recently transplanted often just "sit there" for awhile without appearing to grow because they are sending energy to their root systems instead of to their leaves or flowers. For edible plants like basil, you're supposed to pinch off the flowers so the plant focuses its growth on the leaves (so you can eat them!) I like the metaphor of directing energy in a plant, and I think it applies to humans, too. 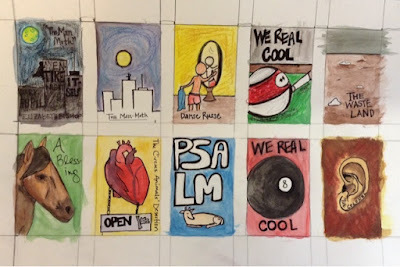 In my recent post about my artist's rut, I said that my creativity had returned. It's true that I no longer feel paralyzed with fear about art-making, yet I still feel like I'm moving very slowly. I realized I must be focusing my energy on my roots - the system inside me that anchors and nourishes myself so I can be stronger. Last year I focused so much on the fruits of my labor (making money, particularly with wholesaling my notecards) that I burned out. This year, I knew I needed a break but thought I would probably have to do another big wholesale push at some point in order to help my income. I felt so wishy-washy about the whole thing. I went to the National Stationery Show last month as a looker (not vendor), which I'm sure I'll blog about soon, hoping it would inspire me to make card new designs and get back into wholesale. But after reading about plant transplants, I decided I'm going to let go of wholesale this year. It's a big relief. I may try to find a few more stockists and I'll supply cards to stores that already order from me, but I don't want that to be my main focus. It's too much for me right now. Now I can focus the energy from "solving the wholesale problem" to healing and strengthening the other things I do. I can always return to wholesale if or when I feel ready to. I am moving to slowly these days in everything I do, and I need to just embrace that. I have to remember that I am re-establishing that subtle internal infrastructure before I can "flower" again. What about you, Readers? Where are you directing your energy at the moment - to the roots, leaves, flowers, or fruits? Actually, I'm not totally sure what leaves would represent in this metaphor. Leaves take in the sun and photosynthesize, providing food to the plant. Okay, this metaphor is getting complicated and I really do need to learn more about plants. Ever since creating my own oracle deck, The Golden Moth Illumination Deck, I've wanted to lead a workshop to encourage others to make their own. But unlike my deck, which was reproduced by offset and digital printing, I thought the experience of making a one-of-a-kind handmade deck would be approachable for beginners, and a refreshing change for me. 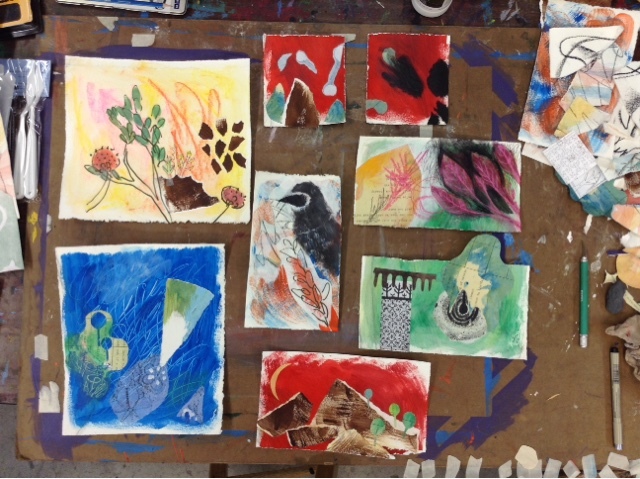 The cards above were some samples that I created using acrylic paint, collage, and ink. 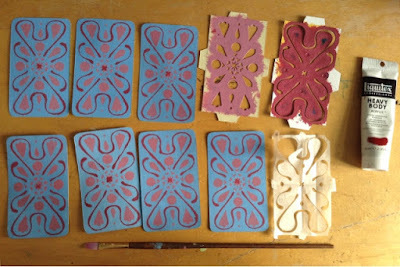 In February I taught my first "How to Make Your Own Fortune Cards" workshop at The Visual Arts Center of Richmond. I will be teaching another section of this weekend workshop on July 18 and 19th, so sign up here if you're interested. 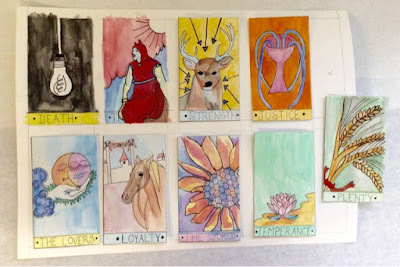 I call them "fortune cards" because I don't want to be too confining by calling them tarot or oracle cards, though they are definitely inspired by them. I thought participants might want the openness of using them for different purposes. The title was also kind of a play on words - people can "make their own fortune" as well as "make their own fortune cards." The participants in the workshop were wonderful. Everyone came in with such an open mind. I loved the concepts behind their cards as much as I loved the cards themselves. Many of the students were at least somewhat knowledgeable of tarot and oracle cards, but there were a couple of people who weren't. Some students professed they had little art experience, so it was pretty amazing to see what they turned out. Every student had their own unique perspective and each approached their cards thoughtfully. 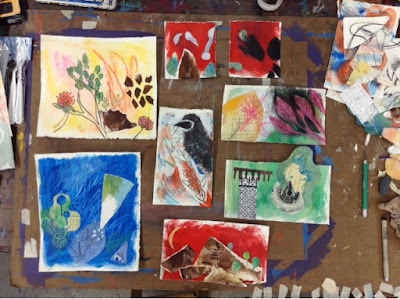 They used watercolor, ink, colored pencil, collage, and photocopy transfer, and they graciously allowed me to share their cards with you. 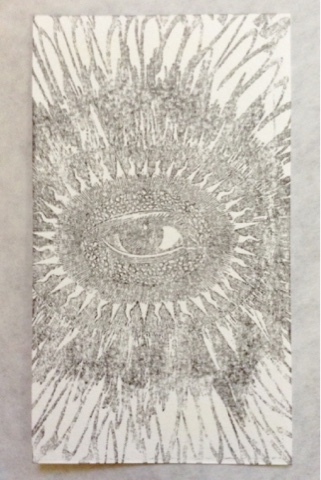 This deck was inspired by the major arcana of the Rider-Waite tarot. She mixed traditional tarot imagery with her own symbolism and and a fresh color palette. 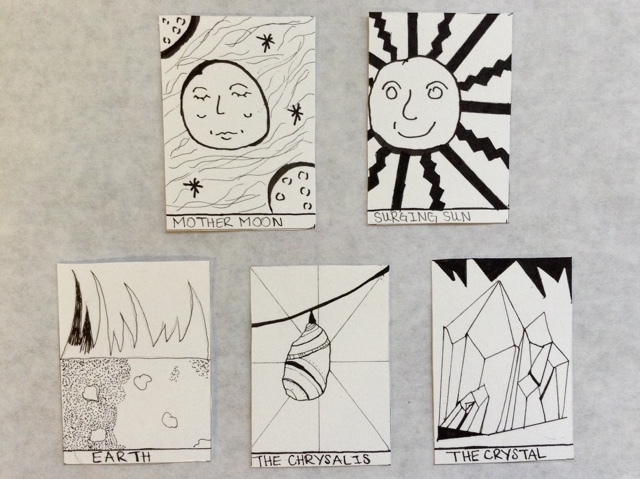 These cards were based on the sun, moon, moths, and butterflies as symbols of introverted and extroverted energy. 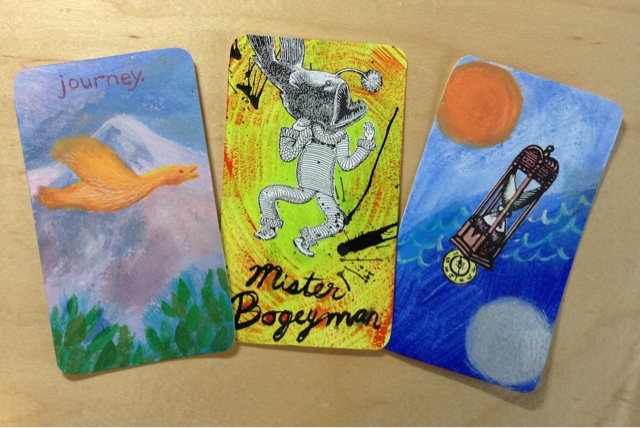 This deck used four suits as in tarot, but each suit was based upon different pyschological states. I love how she used action and sound words in her cards. 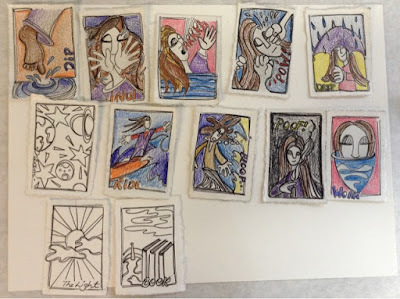 This deck was also based on the major arcana, but each symbol she chose had personal significance in her life. 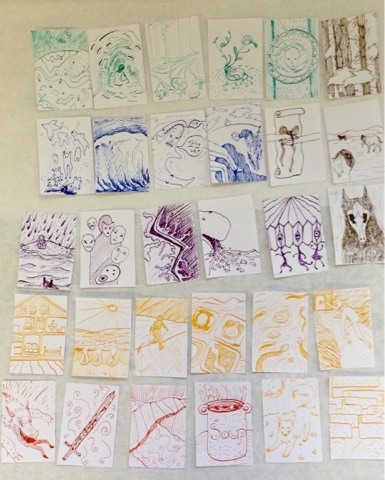 These cards also used personal symbolism, and each card represented one year of his life. He used a cool technique called xylene transfer. 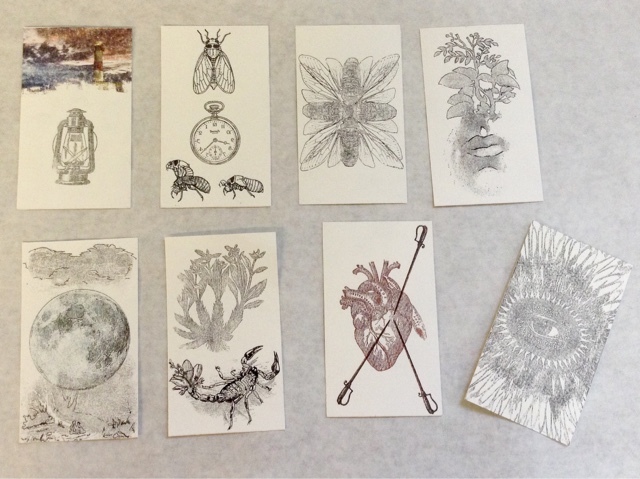 He placed photocopies of images face-down onto his cards, saturated them with a clear blender marker, then rubbed the backs of the copies down hard with a spoon to transfer the images into the cards. This technique works for laser copies in black and white and color, but it's not the best for your health so I'd recommend you do it in a well-ventilated room. 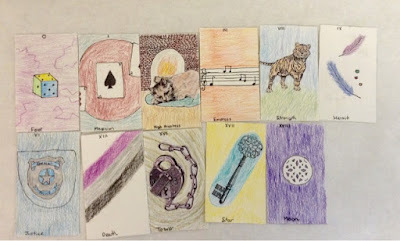 This student is a poet, and she used titles and imagery from various poems to create her deck. Great idea, huh? 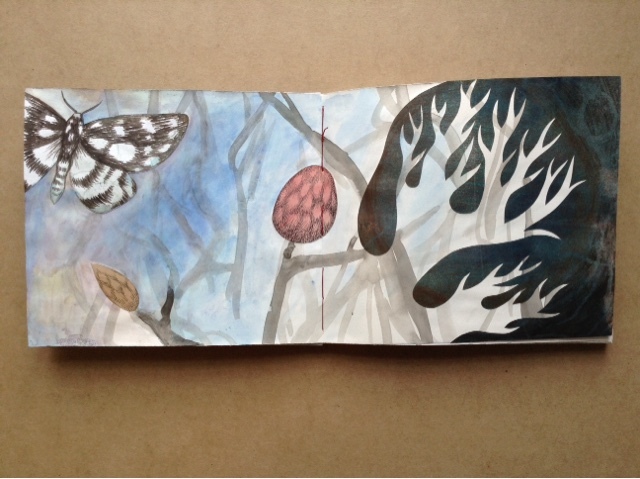 This student is an illustrator who used imagery from her own dreams. Look closer at some of this surreal imagery. She hopes to create a more finished deck in the future, and I hope she does because I'd love to own a copy myself! 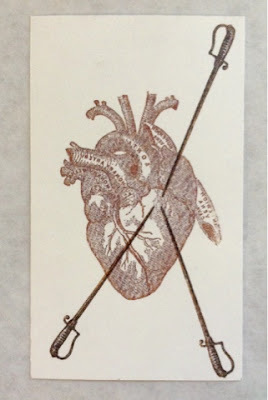 You can check out more of Amy Lovvik's art here. 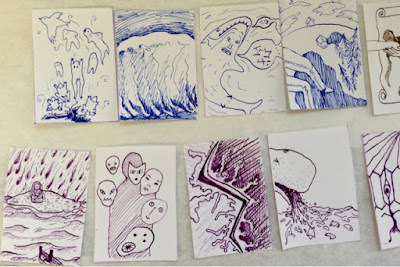 Here are some more sample cards I made during and after the class. 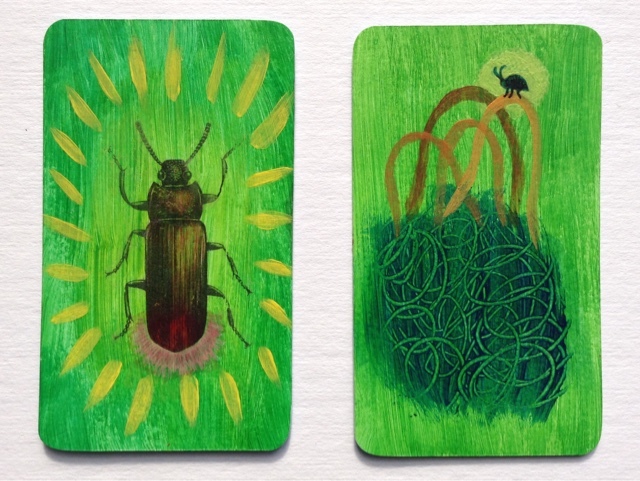 The beetle card in the middle uses another form of photocopy transfer called gel transfer. There are a couple techniques to do this, but for this one I applied clear acrylic medium to my painted card, placed the photocopy of the beetle face-down on top of it, and burnished it so it stuck flat. After it dried, I wet the back of the paper with water and rubbed the paper off with my finger. Some of the image rubbed off, but most of it remained. I also created stencils for the backs of my cards out of cut-out cardstock. I placed the stencils on top of the cards and dabbed acrylic paint on them with a paintbrush. Teaching the workshop made me see how empowering and creative it is for individuals to make their own decks of cards. It was an amazing thing to witness. I hope you've enjoyed seeing some of the wonderful things that came out of this workshop, and maybe you're inspired to make your own! ...finally. It seemed like it would never come. I felt adrift, frustrated, empty. And scared. What if I'd lost it for good? "...quickening, birth, a rising of energy to a zenith, and the beginning of entropy and decline... and then again a death, and then another incubation." I love the way she speaks of the creative process as being part of our nature, and how we need to get out of our own way to give this process the respect it needs. Throughout my life, I noticed the pattern of birth and decay repeating over and over again. I went to art college in New York City, and returned home to Rochester for the summers. I passed the time lazily and lamented to my parents that I wasn't making any art. They always told me, "You need to rest." My parents' sage advice sunk into me all through my growing years, but as an adult I have had to learn to manage my own cycles - and the drive to produce can be intense. "I don't have time to rest. I should be doing something." Last year I focused much of my energy on making a living through my art. 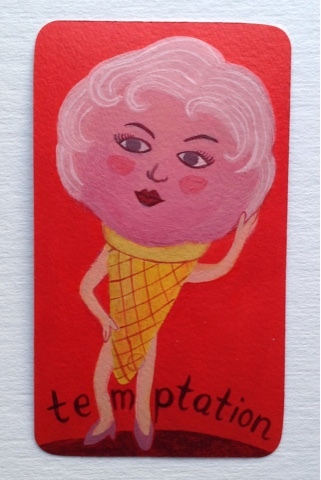 I spent more of my creative energy strategizing ways to sell my art, as opposed to making it. This was necessary for me to do, yet it was exhausting. I have a special relationship with my art. To me, it's a communion with the side of myself that understands truth, beauty, and what makes life meaningful. It's the part of myself that I trust most and feel safest with. This is probably the reason why I don't feel the need to socialize or hang out with friends all the time. To me, art is my friend, my guide. So when I feel like I've lost my connection with it, it's like I'm losing one of the most important relationships I have. We endured a harsh winter. For several months after Christmas, my body and mind felt sluggish. I was in hibernation mode. I let myself rest through most of January and February. I dabbled and experimented with a few different mediums. At times I wanted to push myself harder, but knew I shouldn't. 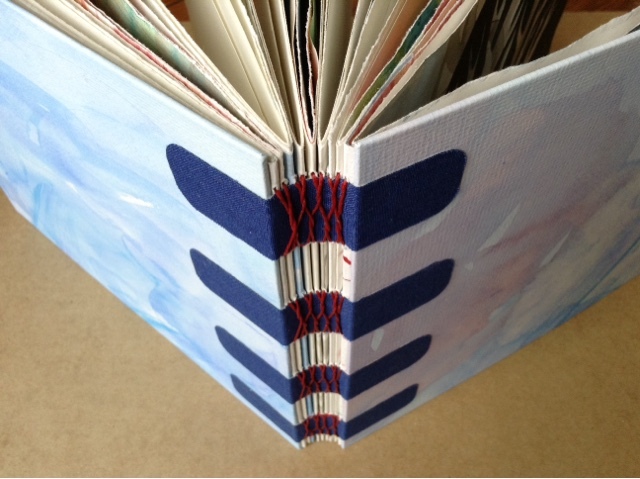 I created a new sketchbook to help me get back into the habit of creating again. Part of me wanted to be like all those successful artists who proclaim that they draw everyday. But I don't draw everyday. And you know what? I don't want to. I think the advice to draw or do something everyday can be very helpful and perhaps necessary to some people. And I'm sure if I did it I would improve my skills. But I don't think it's necessary for everyone, or at least not at all times or stages of growth. There, I've said it. Sacrilege. I don't think that that the purpose of art is to constantly be producing. I think that some of it must come from a deeper drive. Several years ago I listened to an interview with author Zadie Smith. She said about writing: "I think you need to feel an urgency about the act, otherwise when you read it you feel no urgency either. So I don't write unless I really feel I need to..." I love that. There must be a reason that you bring something new into creation. If I created all the time just for the sake of feeling like I'm prolific or valid as an artist, I think there's something damaging in that. Yet I also want to keep the creative channel open and do things for fun. There has to be a balance. In February I took a mixed-media collage class to try to get the energy flowing again. And I produced some things that I liked. But I didn't feel the excitement that comes with that deeper urgency. As the months passed, I was busy with teaching and doing my bookkeeping and taxes, and then Spring came and I thought my creative energy would return. I did a few new things, had lots of ideas floating around in my head, but nothing seemed to catch or compel me. "What is wrong with me? I've lost it. I've just lost it." This past week, I complained to family and friends about my "artist's block." And through those anxiety-filled conversations, a truth came out. At first, I needed a long rest. And perhaps the timing just wasn't right. But wrapped up in that was a sneaky little fear. 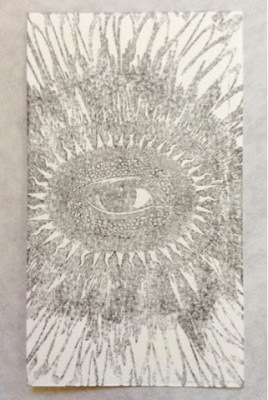 Last year at my printmaking exhibition at Rivermont Studio, I got to see everything up on the wall at once. While I was proud of what I'd done, seeing it all together like that firmed my resolve to go in a new direction. I wanted to tell more stories with my art, to be more personal. I wanted to include more human figures, to incorporate the written word. I wanted to explore complex compositions, to create larger, more dynamic works. I wanted to expand my color palette, to understand the very nature of color interactions and use them successfully in my work. Let's just say it was a tall order. And one that crept into my psyche, whispering "Everything has to be meaningful. You can't do anything like you've done before. It has to be so much better. And people have to really like it." I create art for all kinds of reasons. It's a necessary expression of my thoughts, heart, and soul. It's a meditation for me, a way to center and calm myself. At times it becomes a habit. And really, I just enjoy it. While primarily I aim to please myself, I'm always aware that I'm creating for an audience, especially since I became more serious about making my living from the sale of my art. So stacked on top of the goal to create utterly breathtaking and meaningful work was the worry of having to sell it successfully, which can warp things awfully if you let it get to your head. I knew I had to get back into making art again, or find another job. Recently, I called up my mom and she told me "Do the easiest thing." I decided to take her advice. The easiest thing was to finish up some of the things I started, and to expand upon works that I'd already created. I also referred to some advice in Samantha Bennett's book, "Get it Done." She recommends that when procrastination paralyzes you, aim to get a C rather than an A. And so I'm grading myself with a C. Or maybe a B. But definitely not an A. And it feels good. Maybe it's okay to create stuff just because I think it's pretty and because I enjoy it. Maybe that super-amazing stuff will come in time if I let it percolate a little longer. And so, it's coming back. An inkling of that urgency to create. That fresh, exciting Springtime of Creativity. It's a gentle energy, not overpowering, but I know it will gather strength as I keep up the practice of creating again. It never left me, after all.